I expected stocks to decline on Wednesday because the Fed funds futures market is starting to expect a rate cut and I knew the Fed wouldn’t guide for a cut. The accuracy of the prediction depends on when you executed the trade. Stocks fell on the day. They rose initially after the announcement was made, but then declined, ending the day slightly higher than where they were at 2:00pm (time of the announcement). On the day, the S&P 500 fell 0.29%, the Dow fell 0.55%, the Russell 2000 fell 0.76%, the Nasdaq increased 7 basis points, and the VIX was up 2.58%. It’s tough to say with certainty how traders felt about the Fed’s decision because stocks were down before the Fed statement came out because of trade worries. Trump stated, "We're not talking about removing [tariffs], we're talking about leaving them for a substantial period of time because we have to make sure that if we do the deal with China that China lives by the deal." He’s trying to make sure China sticks with its promises. However, then Trump clarified this point by saying, a deal is "coming along nicely." That’s good news for stocks. While stocks fell in the morning because of trade worries, they may have rallied after that clarification came out if the Fed meeting wasn’t today. While the stock market’s reaction was small, treasuries’ reacted sharply to the Fed decision. The 10 year yield fell 9 basis points to 2.53% which was the biggest one day move in almost a year. That put the 10 year yield just 13 basis points above the Fed funds rate. The yield curve is as flat as a pancake. The yield made a new 52 week low as it hit its lowest rate since January 2018. The 2 year yield fell 7 basis points to 2.4% which is the same as the Fed funds rate. At its lows on the day, it was below the Fed funds rate. That means the beginning part of the yield curve inverted. The difference between the 10 year yield and the 2 year yield is just 13 basis points. That spread is near the cycle low which is 11 basis points which was hit in early December. Just after I discussed the 10 year 2 year spread being in its tightest 3 month range ever, it has made a move towards an inversion. My initial prediction last year was an inversion by the first half of this year. The curve has 3 months to flatten 13 basis points to make my prediction accurate. As I mentioned in a previous article, the 2 year yield doesn’t have much room to fall now that it is near the Fed funds rate. That part of the curve can invert, but there’s a limit to how much it can invert. Unless the Fed cuts rates, I don’t see any way the 2 year yield gets much below 2.3% which is 10 basis points below the current Fed funds rate. Almost every time the 10 year yield falls, it will flatten the 10-2 spread. Generally, when the 2 year yield falls it means the market expects the Fed to cut rates. That is consistent with Wednesday’s action as the chance of at least one cut this year increased to 38%. The market is still expecting lower rates than the Fed is. I think these odds of a cut are too high as I expect the economy to rebound later in the year. If economic growth continues to fall in the next few months, I still don’t see a rate cut coming. The 2 worst sectors on Wednesday were the financials and healthcare which fell 2.09% and 0.67%. It’s easy to see that the financials fell because the yield curve flattened and yields fell. Even though I started the year as a bull on small banks, this declining rate environment will be tough on them. The good news is I see lending eventually improving again as the economy recovers from this slowdown. Those who believe transports are a great way to analyze how the economy is doing should be bearish because the chart below shows the ratio between the transports and the S&P 500 is at a 6 year low. The decline in FedEx stock helped push the transports lower on Wednesday. It was down 3.5% which is good performance considering its guidance, earnings, and revenue miss. Some of the weakness was probably priced in. The chart below shows various estimates for 2019 GDP growth going back to March 2017. In 2017, projections were for growth to be near the long run rate because that’s usually how distant projections start. When the projections come into the intermediate view, economists use current reports to forecast future ones. Since the economy was strong in 2018, 2019 GDP growth estimates increased. Clearly, strong performance in Q2 2018 has no bearing on 2019 GDP, but that’s how estimates work. That explains why many estimates are wrong. Now with weaker economic reports coming out because the economy is in a slowdown, estimates have fallen. This time near term economic reports affect the current year’s growth rate. They also help economists forecast the next 3 quarters of growth. Even though the Fed only moved its 2019 GDP estimate down 0.2%, it is now much lower than the estimates from the World Bank, the IMF, the European Commission, and the Bloomberg consensus. Those government agencies are probably above the Fed because they haven’t updated their forecasts. 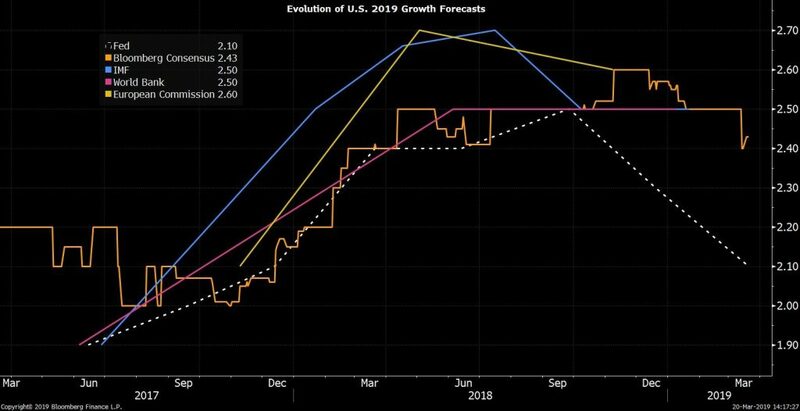 The Bloomberg consensus being at 2.4%, shows us the Fed is quite negative on growth. Interestingly, there are probably some people who are more bullish on growth than the Fed, but expect lower rates than what the Fed guided for since the consensus is for higher growth and there’s a 38% chance of a cut this year.